If your cart, car, or piece of equipment has all straight wheels or is on a rail, then the following ergonomic products help solve material handling applications where no turning is required, or an operator will turn the wheels while a CarCaddy pushes from behind, as in the case of pushing a bus down an assembly line. 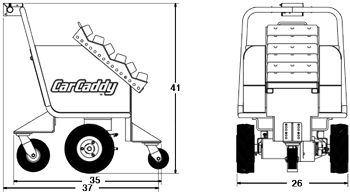 Car Pusher Vehicle Pusher The CarCaddy car and vehicle pusher is a battery powered pusher for pushing stalled vehicles that generally have pneumatic tires (cars, trucks, campers, buses, and other machinery) and don't need to be steered by the CarCaddy itself. Car and Vehicle Pusher Applications Many vehicle manufacturers use a CarCaddy car and vehicle pusher to push the units short distances down a production line from station to station. A CarCaddy also has plenty of power to push a stalled vehicle at service centers or along highways. Car and VehiclePusher Benefits The primary benefit of using the CarCaddy car and vehicle pusher is to prevent the strains associated with pushing stalled cars, buses, heavy trucks, and other vehicles. Overextending the body when manually pushing cars from the parking lot into a service center garage can be extremely harmful to the worker, as can pushing a stalled vehicle from the highway to the shoulder. When a car and vehicle pusher is used for these routine tasks, damage to the body (including back and shoulder strain) is minimized, which keeps employees healthy and reduces workers' compensation. The CarCaddy also prevents damages associated with moving these stalled vehicles using another vehicle. In cases where manpower is not available, other vehicles are used to bump up against the back end of the stalled vehicle. Both vehicles can be dented, scratched, or cracked due to this practice. The front push pad of the CarCaddy car and vehicle pusher is made of a soft, durable, padded material designed to preserve the paint and integrity of the back end of the stalled vehicle while also protecting the car and vehicle pusher.